The conventional wisdom is that with the growing crisis in the rest of Iraq, Iraqi Kurdistan has never been better. ‘Better’ is a relative term, of course. But for a region that also features severe corruption, intense political rivalries, a bloated and unaffordable public sector and fiscal dependence (for now, at least) on Baghdad, Iraqi Kurds have reason for optimism. With Kurdish peshmerga forces in full control of Kirkuk, the Kurdish regional government can now lay claim to the entire historical region of Iraqi Kurdistan. Former Iraqi president Saddam Hussein, notorious for his crackdown against Kurdish identity and nationalism, encouraged Arabs to relocate to what Kurds (and Turkmen) consider their cultural capital. Under Article 140 of Iraq’s newly promulgated 2005 constitution, the national government is obligated to take certain steps to reverse the Saddam-era Arabization process and thereupon, permit a referendum to determine whether Kirkuk province’s residents wish to join the Kurdistan autonomous region. Like in many areas, from energy to electricity to education to employment, Iraq’s national government has made little progress on the Kirkuk issue. Kurdish leaders now say they will hold onto Kirkuk and its oil fields until a referendum can be arranged. Realistically, there’s little that Baghdad can do to reverse Kurdish gains. That, in time, will give Iraqi Kurdistan the oil revenues that it needs for a self-sustaining economy, in tandem with growing Turkish economic ties that crested last year with the completion of a pipeline between Kurdistan and Turkey that allows the Kurdish regional government to ship crude oil out of Iraq without Baghdad’s approval. In that regard, the rise of the Islamic State of Iraq and the Levant (ISIS or ISIL, الدولة الاسلامية في العراق والشام, ad-Dawla al-Islāmiyya fi al-’Irāq wa-sh-Shām‎), which now controls much of northern and northeastern Iraq, including much of al-Anbar province and northern cities like Mosul and Tikrit, has been a boon for the cause of Kurdish nationalism. We will guard and defend all areas of the Kurdish region – Kurd, Arab, Turkmen, Assyrian, Chaldean, all will be protected. We will endeavor to redevelop and systematize all regions of Kurdistan. We will use our oil revenue to create better and more comfortable living conditions for our citizens. And until the achievement of an Independent Kurdish State, we will cooperate with all to try to find solutions to the current crisis in Iraq. With all our might, we will help our Shia and Sunni brothers in the fight against terrorism and for the betterment of conditions in Iraq – although this is not an easy task. Amid that backdrop, the various political parties formed a new Kurdish regional government last week, two months after Iraqi national parliamentary elections in Iraq and fully nine months after Kurdish regional elections. As the United States leans on the Iraqi parliament to form a new government quickly, in order to combat more effectively the ISIS threat in Sunni-dominated Iraq, the Kurdish example is instructive. If it took nine months to reconstitute the Kurdish regional government, is it plausible to expect Shiites, Sunnis and Kurds to form a national government, under crisis conditions, in just two months? Even under calmer conditions in 2010, it took Iraqi prime minister Nouri al-Maliki nine months of coalition talks to build Iraq’s previous government. Though Maliki’s Shiite-dominated State of Law Coalition (إئتلاف دولة القانون) won the greatest number of seats after the April parliamentary elections, many Iraqis fault his heavy-handed style for the sectarian crisis in which Iraq now finds itself. In the first meeting of Iraq’s 325-member Council of Representatives (مجلس النواب العراقي‎) last week, Sunnis and Kurds alike walked out on Maliki, and there’s not much hope that a second session on Tuesday will result in additional progress. In Kurdistan, last September’s regional elections saw the continued rise of a third force in Kurdish politics, Gorran, or the Movement for Change (بزوتنه‌وه‌ی‌ گۆڕان‎‎). After doing particularly well in the 2009 Kurdish elections, Gorran eclipsed the Patriotic Union of Kurdistan (PUK, یەکێتیی نیشتمانیی کوردستان), the party of Iraqi president Jalal Talabani, which has long been the strongest force in southern Kurdistan. Gorran, which draws much of its support from former PUK supporters, was able to take advantage of Talabani’s poor health to make further political inroads. 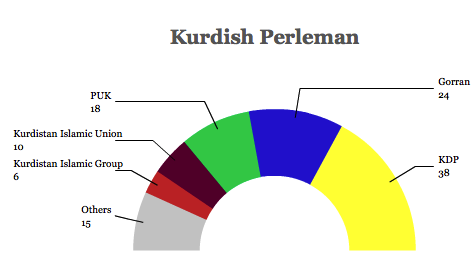 Barzani’s Kurdistan Democratic Party (KDP, پارتی دیموکراتی کوردستان), long the dominant force in northern Kurdistan, gained eight seats in the 111-member regional parliament, the Perleman (پەرلەمانی كوردستان) nine months ago, and which won the greatest number of seats from Kurdistan in Iraq’s Council of Representatives, will continue to lead the government. In the post-Saddam era, the KDP and the PUK, which fought against one another in the mid-1990s Kurdish civil war and which even today maintain separate peshmerga forces, have taken a largely allied approach to Iraqi national affairs. Since the advent of regional parliamentary elections, the KDP and the PUK have formed a unity government within the autonomous Kurdish region. With Talabani holding Iraq’s largely ceremonial national presidency, Barzani has led Iraqi Kurdistan since 2005 and his nephew, Nechirvan Barzani, has served as Kurdistan’s regional prime minister since March 2012 (and previously from 2006 to 2009). Under the terms of the latest Kurdish government, Barzani will once again head a unity government, this time incorporating Gorran as well as the PUK. That will give the Gorran leadership some role in Kurdish policymaking through what could be the most defining years of Kurdistan’s rise from de facto to de jure statehood. But it also deprives the Kurdish government of any real opposition, other than a couple of Islamist groups. In the meanwhile, the Kurdish government has a tough road ahead, notwithstanding the giddiness of taking Kirkuk. Since 2003, Baghdad and Erbil have had an informal agreement that Iraq’s national treasury will transfer 17% of the national budget to the Kurdish regional government. But over the past year, as Baghdad and Erbil have repeatedly clashed over Kurdistan’s newly aggressive push to export oil independently of Baghdad, Maliki refused to make the payments to Kurdistan’s government, which has left it nearly bankrupt. For a region that runs highly on political and government patronage, that gives Baghdad considerable leverage — for now. The only thing reportedly keeping Iraqi Kurdistan financially afloat these days are the billions of funds that the Talabani and Barzani families managed to skim away after years of corrupt leadership. In a region where nearly 75 percent of the workforce relies on the government for a paycheck, public sector employees weren’t paid for months resulting in widespread public dissatisfaction. As banks experienced a liquidity crisis, the Kurdish owner of Asiacell, the country’s largest telecom, was asked to provide $130 million to prevent a financial collapse. At current Kurdistan oil production levels, the KRG will be financially unviable. Assuming they can extract and market oil, at best the Kurds could hope to be financially independent by 2017. That means that Maliki, or any other Shiite leader, will have a powerful card to play to maintain support from Kurdish leaders for a national unity government in ongoing coalition talks. That doesn’t mean that Maliki will form a government anytime soon, notwithstanding US and Iranian impatience. But it makes it more likely than not that Kurdish leaders will cooperate with Baghdad for the short-to-medium-term future. In the meanwhile, though Turkish officials quietly supported the Kurdish government’s efforts to assert order over Kirkuk province, they have in recent days tamped down speculation that Turkey might favor full independence for Iraqi Kurdistan. For now, both Ankara and Washington officially support a unified Iraqi state. 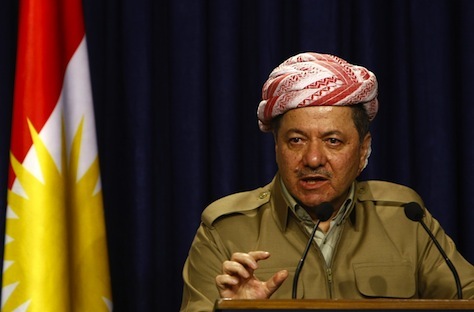 But that, too, could change in coming years as more allies back the Kurdish nationalist call. Israeli prime minister Benjamin Netanyahu, for example, openly supports an independent Kurdistan, and even US vice president Joe Biden, dating back to the days when he was in the US Senate, has long advocated a tripartite, highly decentralized state as the most natural form for Iraq. Moreover, Turkish attitudes to Kurdish nationalism, both within Iraq and within Turkey, are changing. Among Turkish prime minister Recep Tayyip Erdoğan’s chief accomplishments are better relations with Turkey’s Partiya Karkerên Kurdistan (PKK, Kurdistan Worker’s Party), which declared a ceasefire last year. Photo credit to Safin Hamed / AFP / Getty Images. Previous PostDon’t rule out Sarkozy just yet for 2017 comebackNext PostIs Ghani’s Afghan preliminary electoral victory a fraud?